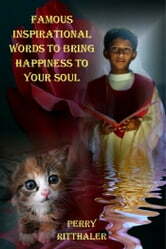 "Famous Inspirational Words to Bring Happiness to Your Soul" is written to give you a glimpse of some of the beautiful pictures from Tia Land complimented with the most powerful secret phrases written traced back through history. When I first began to do the research for this book, I could not believe all the people who knew of these famous secret words. They were the greatest people in history. Over time, I put together a collection of these most powerful phrases found throughout written history and included what I considered the best ones into this e-book to share with you, the readers. The quotations and inspirational thoughts found in this e-book will provide you with an opportunity to build health, wealth and happiness while leading you on a path to achieve everything you ever would want in life. The Law of Attraction always works. It works ever time with every person. Our lives are not determined by what happens to us...but by how we react to what happen...not by what life brings to us...but by the attitude we bring to life... A positive attitude causes a chain reaction...of positive thoughts, events, and outcomes...it is a catalyst...a spark that creates extraordinary results. You can have whatever it is you choose no matter how big it is through following the advice and wisdom of the greatest thinkers of all time. I Am Out of the Box Now What? 4:00 A.M. A Productivity Argument.